Welcome to the snowy start of the spring semester at UWM! It is January after all. It’s also a traditional time of looking forward and backward simultaneously much like Janus, the Roman god of doorways, for which January is an eponym. I think we can all be proud of significant accomplishments in 2018 and share optimism about what’s ahead. UWM maintained its top-tier research status. It is no small feat to attain for a second time what is considered the “gold standard” research classification from the Carnegie Classification of Institutions of Higher Education. It is affirmation of the remarkable impact of UWM’s exceptional faculty, staff, doctoral students and researchers. What makes this even more impressive is that we achieved this during the most challenging headwinds and budgetary times in our history. Phenomenal research continues and here is a description of the largest research grants of 2018. A campus celebration of our R1 renewal is in the planning stages with an anticipated gathering in April. UWM exceeded its new and increased $200 million campaign goal. The campaign is raising support for student success, research excellence and community engagement. We continue to receive extraordinary support from donors and look forward to a campus celebration this fall following the conclusion of the campaign at the end of this academic year. We welcomed more than 2,000 students who joined us from the University of Wisconsin’s 2-year colleges in Waukesha and Washington counties. The restructuring increases opportunities and makes college even more accessible to people in southeastern Wisconsin. UWM advanced several major partnerships in 2018. We worked closely and quickly with Northwestern Mutual (NM) and Marquette University to create the NM Data Science Institute – a cutting-edge partnership that advances Milwaukee as a national hub for technology, research, business and talent development. We also launched the Higher Education Regional Alliance (HERA) to increase post-secondary completion and reduce the skills and talent gaps in southeastern Wisconsin. We have a lively semester ahead, beginning with winter welcome campus activities and a change with my plenary address. The new semester starts strong with a myriad of events and activities to help you meet new friends and colleagues, and to explore our winter-time campus. I encourage you to engage and see all of the remarkable things UWM offers during Winter Welcome, from sports and recreation, to community volunteering opportunities, to arts and crafts, and hot chocolate and coffee socials, and more. After careful consideration, vetting with governance leaders and a review of other campus’ best practices with plenary/state of the university addresses, we have decided to discontinue spring plenary addresses at UW-Milwaukee. Rather, we will focus on continuously updating our campus community on developments, accolades and strategic activities. I’ll look forward to sharing my Fall plenary address, which is tentatively scheduled for Sept. 19, 2019. In retrospect, UWM made significant progress toward opening the doors of the Lubar Entrepreneurship Center (LEC) and the Connected Systems Institute. Looking ahead, we anticipate that both will open in late spring. Throughout 2019, we will spotlight UWM’s entrepreneurial partnerships, activities and people. The spring semester is, indeed, off to a lively start. I look forward to and wish you all the best for a new semester. 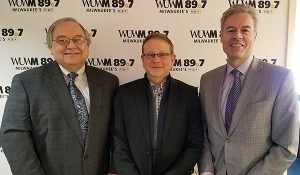 Chancellor Mone was joined on his latest WUWM show by Dave Vasko, Director of Advanced Technologies at Rockwell Automation. WUWM GM Dave Edwards is also pictured.